From the Top Show 273 was taped at the historic Plaza Theater in El Paso, Texas in June 2013. Learn what the performers have to say about their musical performances and the experience of being on From the Top. This piece was written by the Russian composer Reinhold Gliere. The Russian style of the piece brings images to my mind that relate to Russia. For example, the opening chords, which repeat later, sound like the entrance of the Czar and Czarina. I think one section sounds like Cossack dancers and another part sounds like pirouetting ballet dancers. One tranquil section reminds me of a gliding swan and soaring hawk. Before the recap, the piece builds in excitement, and I imagine a scene where the hawk is pursuing a pigeon and he finally overtakes his prey. This is my favorite part. This is the most challenging piece I have learned so far. 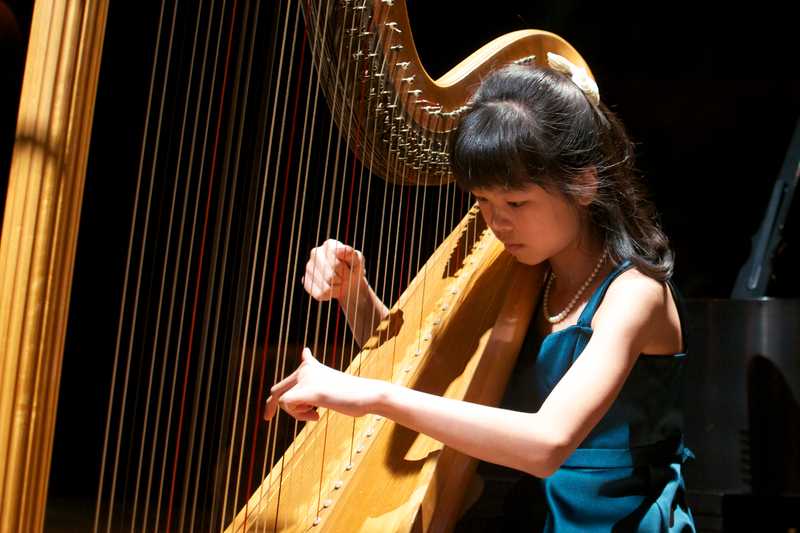 It is a required piece for the American Harp Society National Competition. There is a lot to think about while I am performing this piece; keeping it clean, getting the numerous pedal changes (in one place there are 13 pedal changes within two measures) and the dynamics. I hope the audience enjoys this piece as much as I enjoy playing it. Post-Show Reflection: It was so fun to be a part of a From the Top show! I really enjoyed meeting the other musicians, all of the encouraging and helpful staff, and Christopher O’Riley. Seeing how the show was put together behind the scenes and on stage was a new and exciting experience for me. I was very nervous backstage before I performed, but once my interview began, I felt more relaxed. Music has the power to change lives and bring people together. I love French organ music. 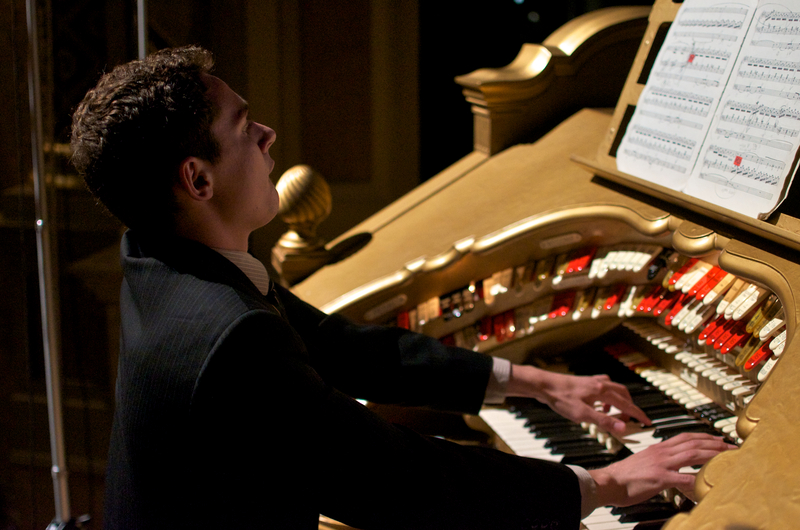 The Toccata from Suite Gothique by Léon Boëllmann is special because of the imagery it invokes while I play this piece. I imagine Lake Michigan on a stormy day. Something is brewing in the horizon, a sea monster arises. Near the end of the piece, Chuck Norris comes out of NOWHERE and slays the savage sea monster and all peace is returned. The whole scene turns “triumphant” as the sun comes out on the last chord of the piece. I absolutely love this piece because of what it offers to the listener. It is a piece that keeps you at the edge of your seat. One of the things I enjoy most about the piece are the dynamic contrasts, and the ending chord progressions are just so much fun. It is a very fun piece for the performer. Of the entire clarinet repertoire, Weber’s Concertino has a special place in my heart. From the age of eight years old, I would listen to recordings of Stanley Drucker and the New York Philharmonic (under Zublin Mehta) performing this piece. This simple YouTube recording was something that helped fuel my passion for the clarinet at the time. It was only several years later when I began learning the piece. Weber is a composer known for his outstanding operatic compositions. I feel that the slow introduction of the Concertino so greatly resembles the human voice. Its written in what many would agree is the most singing register of the clarinet. The piece begins in a minor key that cries out the emotions of longing despair. Only in the end of the introduction is this pain quietly set aside. The harmonic structure of this introduction, though, isn’t the only musical content that translates into emotions. The rhythmic layout is remarkable in its syllabic and almost linguistically comprehensive quality that it is quite sing-able. Often times, I put words to phrases in this beautiful and remarkable opening. The piece continues with a theme, of which I imagine as a delightfully simple children’s song. The tune is so simple in its melodic phrasing that the proceeding variations fall so naturally in place. These variations really show off a lot of what the clarinet can do. 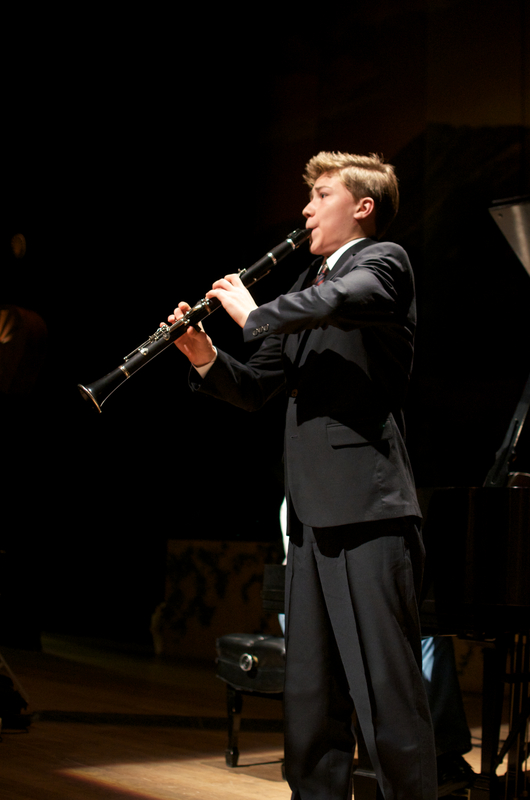 Weber uses over three octaves of the instrument (the modern clarinet can almost hit four) in which he also marks in exhilarating staccato and trills. The piece, though, hits a turning point after the third variation. As you may remember, the somber mood of the introduction was never completely resolved. It was as if Weber swept it under the carpet only to be rediscovered in a section marked “Largo”. The largo section is written in the lowest register of the clarinet in which the music yet again moans with emotion, reiterating the pain (not literal!) of the introduction, though with even heavier content. All of this pain is finally resolved with a major chord in the ending of the Largo. Weber follows this success with a joyful and celebratory Allegro. This Allegro marks the final section of the piece, which finishes in an acrobatic, joyful, and declarative manner. Everything finally comes to a close through raging arpeggios and flying scales. I hope, as the performer, that the piece ends satisfyingly and the listener has been taken through an exciting and exhilarating journey. When I perform this piece, I try to bring the listener through a journey (as I mentioned before). I hope to communicate the utmost emotional content of the introduction while, later, being able to play the variations with grace and joy. Most of all, I want to touch the listener. I hope that my performance of the piece will bring them inspiration, excitement, and passion. The difficult parts of this piece for me are the intonation in the introduction as the clarinet always tends to go flat in its bottom/lowest notes, and maintaining and even staccato in the variations. This piece hasn’t yet failed on bringing me, the performer, through a remarkable journey. This piece is especially unique in that it has both a beautiful introduction and acrobatic allegros and is still able to manage to come together as a whole. For this performance, we’ve cut the Largo and several variations due to time constraints. Post-Show Reflection: I’ve watched and listened to From the Top my entire life, and listening to the show has always been such an amazing source of inspiration for me. It was almost unreal actually performing on From the Top alongside Mr. O’Riley. A total dream come true… and it was a blast! I believe music has the power to immensely inspire our minds and bring joy to our hearts. Music brings people together regardless of their backgrounds and encourages passionate creativity. It’s a language we can all speak and create, and is something that can even break down barriers. The thought that goes through my mind when I’m playing this piece is a sort of wild dance that gets crazier and crazier. I love this part towards the end that’s like a pumped up version of the original theme, and I get chills every single time I play it. I can’t really find any part in this piece that I don’t like, including the middle section with a slow theme, despite my strong desire for faster passages; perhaps the piano at this point keeps my adrenaline rush going. Speaking of dance, I once played this piece for a school play in fourth grade, where the scene was a medieval party. They were all dancing in circles with everything going according to the script and suddenly my violin went completely out of tune. Even now, when I see their reactions on the video of the play, I still think it’s hilarious. This is a fast and energetic dance and definitely one of the most entertaining pieces in my repertoire as I am able to express myself freely by playing together with piano in such a varying tempo range. Compared to other pieces that I have played, this song allows for a lot more freedom to express my individuality. The most difficult thing is playing everything precisely while still maintaining the festive mood especially in the later parts of the piece. It is really easy to get carried away technically and then end up tearing through the whole thing. Making sure that this piece sounds and feels like a dance is the most important thing to remember, and in the end, all I do is just enjoy it! Post-Show Reflection: My favorite experience during the weekend was the Arts Leadership Orientation. I still remember clearly how we all sat in a squared “U” at the conference table listening and interacting with each other about just what an Arts Leader is. At that moment I realized I was sitting in a room with some of the most amazing young musicians I had ever met. It was a surreal experience to be able to talk with all the other performers and discover that we are all similar at heart though we express ourselves in contrasting ways. The time we got to spend with each other was very inspirational, and I wish to meet many others like them in the future. Getting to perform on From the Top with Christopher O’Riley was one of the greatest experiences ever, knowing that I had performed on that stage before, and now doing it again for a completely different event. Through the piece I went into my own little world of the Polonaise Brilliante, a joyful dance that I could not help but smile to. It took a while for my mind to catch up to reality, and by the time I was bowing I suddenly realized I was performing for the world. Knowing that this performance was going to be heard by over 700,000 people had greatly motivated me to do my best. I wanted it to be a performance of a lifetime, and it turned out to be much more as I had a giant grin on my face when I walked off stage. In the past years, my exposure to music has taught me that music has the power to heal, to convey ideas, to connect with others and bring people together. Everyone has differing ideas and opinions about music, but usually we can find consolation in our favorite songs or a great performance that we see. Recently, I have discovered that it can also heal groups of people, it can unite beings from vastly different places and lifestyles. Music is the universal language that people can either listen to, or make, or both! Through the activities at From the Top, I realize that as musicians our job is to share what we know with others for the well-being of humanity itself. Many From the Top alumni have used their musical talents to go beyond the concert hall, to go the extra mile in music, and I hope everyone can do so as well. When listening to this piece, I suggest listening to the Theme and see how it gets developed. It’s a Theme and Variations piece. There are many different characters in this piece. For example, the first variation has a character of violin-like. It reminds me of my friend who played this piece for me so many times. The unique thing of this transcription is the way the composer uses the harmony. It’s very dissonant, interesting, and unique. This creates lots of new sound for performers like me to explore. It’s a very tumultuous, chaotic onslaught of harmonic tension that is delineated by a profound lyrical break. I think of the artillery shells and Luftwaffe bomb strikes that the Germans used in their invasion of Poland in 1939, two years before this piece was written, whenever I play it. I think my favorite part is the Poco Lento middle section that breaks us away from the “battlezone” and allows the dust to clear with its contrary triads. The most unique aspect of this music is I think the relationship between the accompanying lines and the melodic ideas. Lutoslawski retains the basic melodies of Paganini’s original capriccio, but spices them up with rhythmic and harmonic ideas that alone aren’t too revolutionary, but together are quite extraordinary. Not many pieces accomplish this as well as Lutoslawski’s arrangement. Post show reflection: Certainly the flight to El Paso was a favorite memory of mine. It was my first flight ever, and it was an exhilarating experience. I recall looking out the window, like the dork I am, during that initial acceleration. It was one of the most mind-blowing things I’d ever seen. The funny thing to me is how others on the same flight—even my “twin,” In, —took for granted something I thought was incredible. 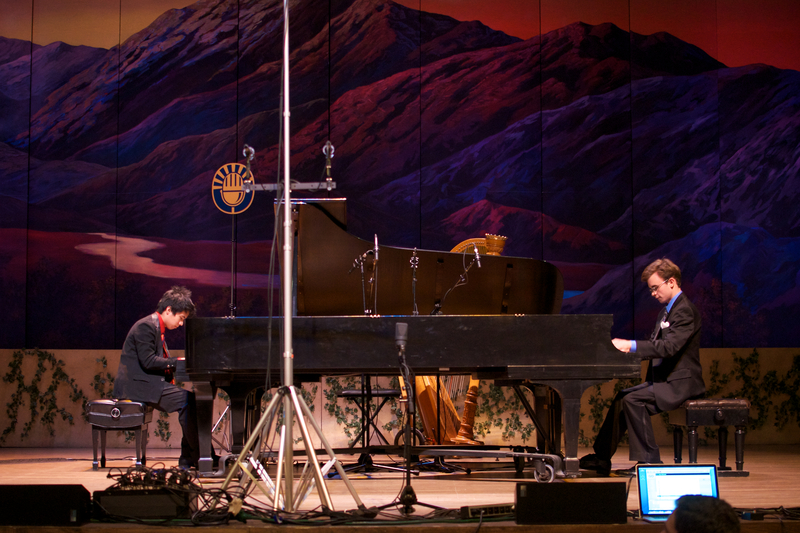 As I was introducing the piece In and I were about to play, I thought to myself, “this is an immense blessing.” When we walked to our pianos, I wasted no time in ensuring my seat was in order, and my hands had assumed the position. I patiently awaited In to look me in the eye, and once he did, we both knew that it was time to get the show on the road. 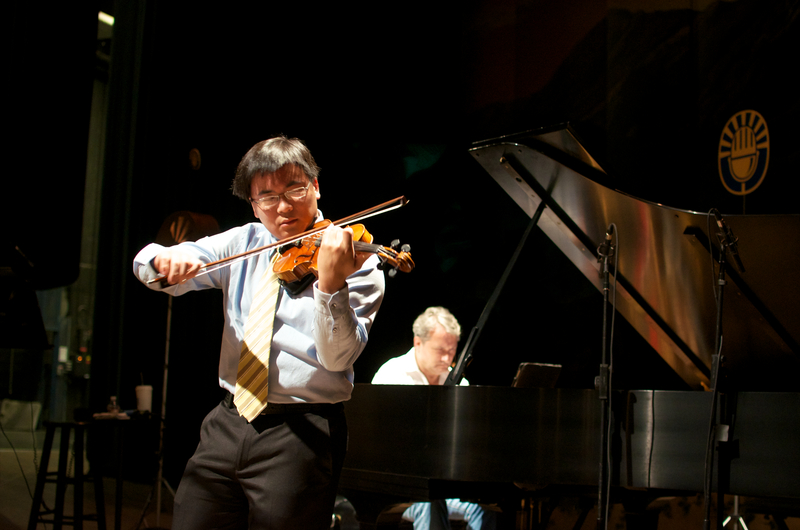 Both of us had enough experience performing separately and together that it was a breeze. I know I certainly had fun; I imagine In did too. We had our rough spots, but we muscled through it and acted like nothing went wrong at all. Even as we had to fight our pianos in some places, we just let the adrenaline take its hold on us and the audience alike, seeing where we would go. As I pounded that last chord, I thought, “we done good.” It was the most fun I’d ever had onstage. Music has the power to ignite passions in others. We saw this during the counter-culture of the 60s, where rock was an important medium through which ideas were spread, especially those of cultural and social change. I know that in me it ignites the passion to do something good for others, for the community, for the world. I want to use music in some way to make this a better place for all of us, if I can. I believe music also has the power to heal. I can speak again from my own personal experience that its influence in my life has helped me muscle through difficult financial, emotional, or spiritual times over the course of my days on Earth.